Webflow is a powerful web-based drag and drop tool for building responsive websites. We use Webflow to build CozyCal's website and love it! 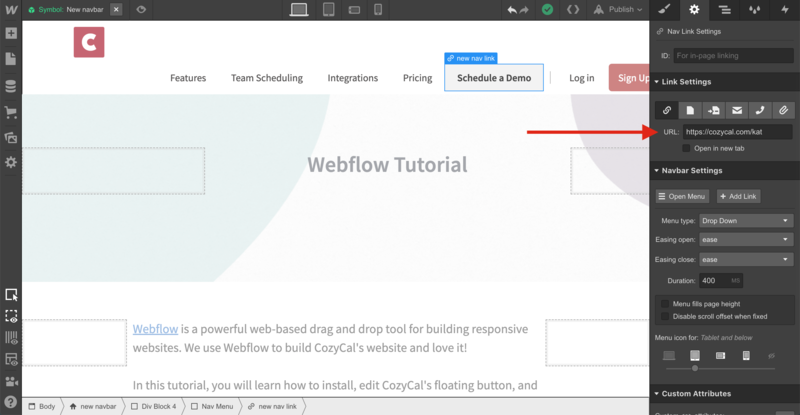 In this tutorial, you will learn how to install, edit CozyCal's floating button, and use your own button on your Webflow website. 1. Sign up or log into your CozyCal account. 4. Log into your Webflow dashboard, then on the left hand side navigation bar, click on Settings. 6. 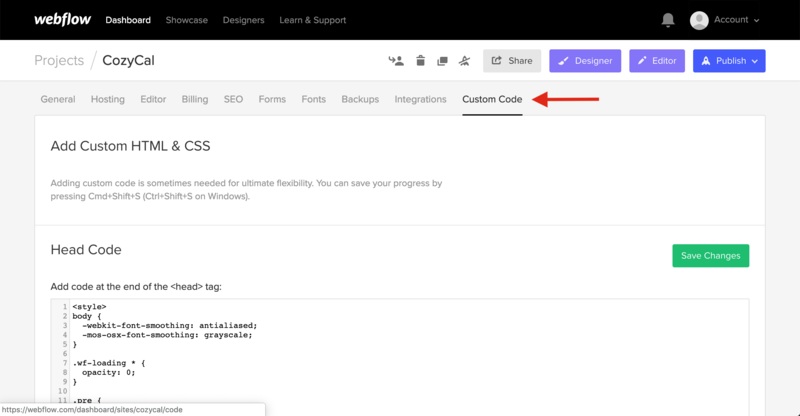 Scroll down and paste your code in the Footer Code, then click on Save Changes. ‍Note: The code shown in the image below is only an example code. Please make sure you are pasting your own unique code. 7. Go back your CozyCal's installation page, and click on Next: Verify Install → Verify Install to make sure that the installation is verified. You can customize the color, text and position of the CozyCal button on your website. Simply go to Settings & Team → Website Setup → Edit Floating Button, and edit the setting based on your preference. If you prefer to use custom button on your Webflow website, you can do that easily. CozyCal detects booking page links on your website and automatically opens them in a modal. Note: To enable the booking page modal opening up directly on your website, you have to first install the CozyCal plugin. 3. On your Booking Page, click on the Share button, and Copy Link. 4. Add your booking page's URL (e.g. https://cozycal.com/kat), to any custom buttons, image or text on your website. Now, your booking page will pop up as a modal.